In late December 2008, I stumbled across this lone cedar tree at the edge of a field west of Dumas, Arkansas. My curiosity led me to barge in on and be welcomed to a Christmas party at which the hosts told me the story of the tree. It is a story of evil and good. Click here to read the original story on the Photo of the Week Page at Corndancer dot-com and click here to read the rest of the story on this site. Click here to see nine additional pictures of the tree and what is under it. The old Stewart store at New Edinburg AR. In the left background, you can see the recently restored Clement Hotel. 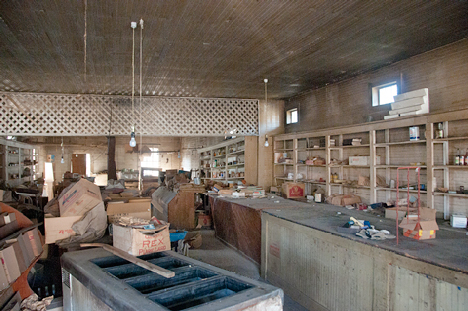 The owners of the hotel recently purchased the store with intentions of restoring it, much like they restored the hotel. That’s good news for New Edinburg. Next door to this store, which has seen better days, sits the just-restored vintage 1879 frame-built Clement Hotel. The hotel owners, with a vested interest in how the neighborhood looks, recently bought the old store. We are told the new owners, Willie Carroll Livingston and his wife, intend to give it a good restoration working over just like they did the hotel. Before we go further, you can see pictures of the hotel and find out about the restoration by the owner and his wife on the Photo of the Week page at Corndancer dot-com. You can also see another picture of the store on the Corndancer site.Click here to go there and get up to speed on the start of this story, a very cool thing to do. We’ll wait here for your return. 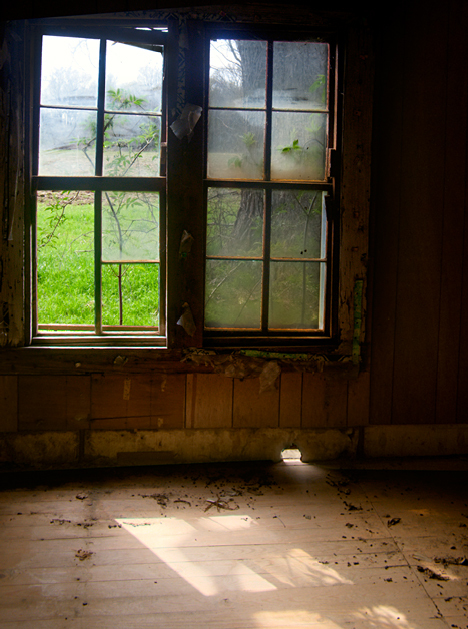 When we went to New Edinburg AR to shoot the old hotel, we were laboring under what turned out to be the delusion that we would be able to shoot the inside as well as the outside of the property. Unfortunately, the keys to the hotel were not available so there was an immediate change of plans. Fortunately, in this life, when one door closes, another frequently opens, which was the case on that day. Turns out, relatives of the selling family were to open and empty the old store, which gave us the opportunity to shoot with impunity inside the old store which would never be the same again after today. 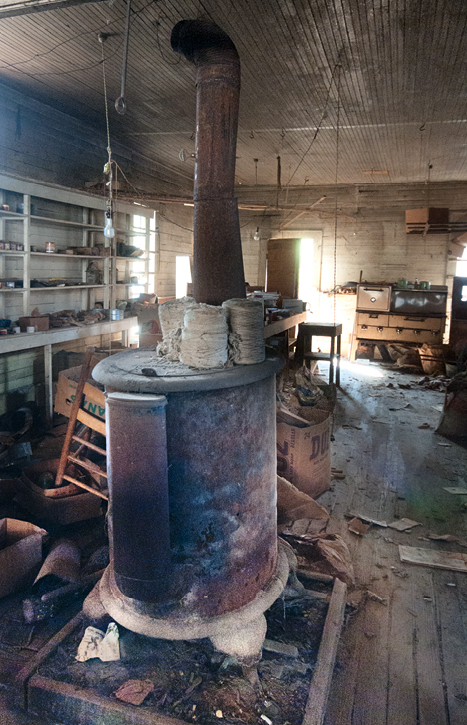 Old wood stoves similar to this one were the de rigueur heating system for most old country stores. On chilly days, customers who walked into the store would head straight to the stove for a quick warm up and summary of the latest goings on. Notice the old range in the background. Clutter was the order of the day. 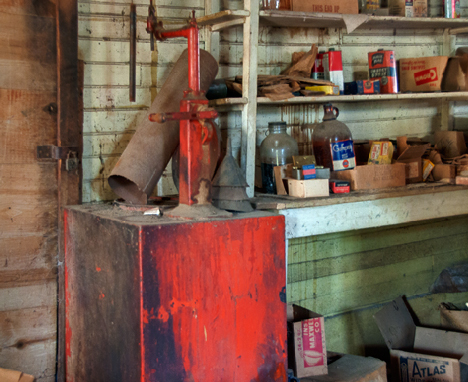 We found an old kerosene storage tank and pump, a large wood stove and an old thirties era range. But the store was more than a store, the proprietor of the store, Leslie Stewart, was a Justice of the Peace with judicial authority. Near the wood stove was a kerosene tank. Almost every store at that time had one. The tank has a self-contained pump. Kerosene, known widely as coal-oil, served as fuel for lanterns and as a fire starter for wood stoves. Long before EPA, OSHA and dozens of other pervasive sets of initials, a wood stove and a nearby kerosene tank were compatible. Now, NADA. Justice Stewart regularly held court in the store. Some of the more racy cases would draw substantial crowds of onlookers thirsting for spicy details . One of my New Edinburg friends looked in a court docket book and found where his uncle was fined $10 for selling alcoholic beverages to minors. The dockets will make interesting reading. The old Finch McCullough store in New Edinburg AR was formerly a Methodist Church. After the store owners bought the building, they moved it to this location, about a block away from the old Stewart store on Arkansas Highway 8. It was early in the afternoon and my breakfast had long since ceased to effectively fuel my activities. Feeling the need to replenish my system, I ambled down to the only store in town still in business, McClellan’s Country Store. This is not the first time I have visited the store to satisfy my hunger. 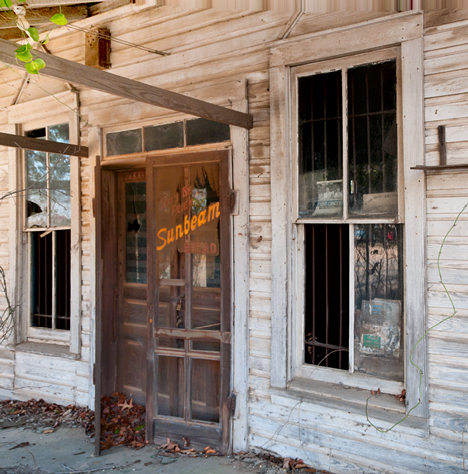 At the time of my first visit, the store was known as Spears Country Store. Like before, I ordered a ham and turkey sandwich with all available add-ons. What I got was a huge gastronomical delight. The sandwich should have been measured in pounds or cubic feet, whichever was more appropriate. Huge and yummy good. 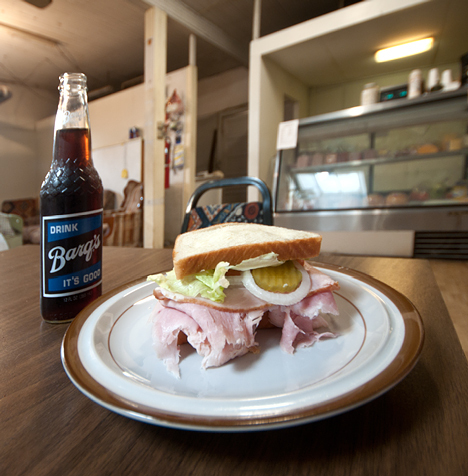 Accompanied by a Barq’s Root Beer in a traditional longnecker bottle, the meal was perfect for a Saturday afternoon lunch for a good ol’ boy. McClellan’s has their act together. It is refreshing to be around people who see something good to do and proceed to do it. That’s what I found in New Edinburg. Every week we shoot more pictures than we have room to show on this page. So, to make sure you are not deprived of the complete story, we put all of our weekly pictures in a gallery of pictures only. This week there are 20 pictures, nine of which you have not seen. These pictures include more shots in the store, a shot of some shelf products left in the store and a bunch of other good stuff you will enjoy. Click here to see these pictures. 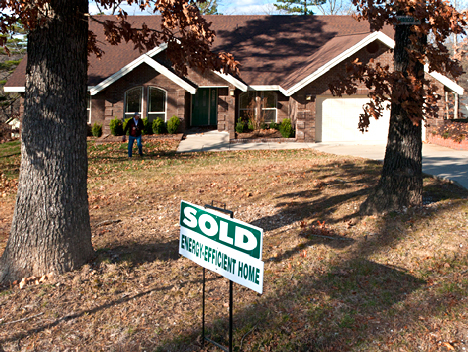 My friend, Barry Noll has just locked his new energy efficient home after we gave it a shooting. The good news is one of my best friends and his wife have bought a new house. The bad news is, it is in Rogers, Arkansas, some 267 miles removed from my domicile, as opposed to the current 20 mile distance. It was with mixed emotions that I agreed to photograph the new home, when Barry Noll and his wife Barbara Freeman made the request. Fulfillment of that request precipitated a story and a bevy of pictures including a 70 mph shot of a tunnel entrance. Before we go forward may I suggest that you go to the Photo of the Week page at Corndancer dot com and get in on the start of this story and see the tunnel picture. We’ll wait here while you peruse. Click here to go there, a cool thing to do. 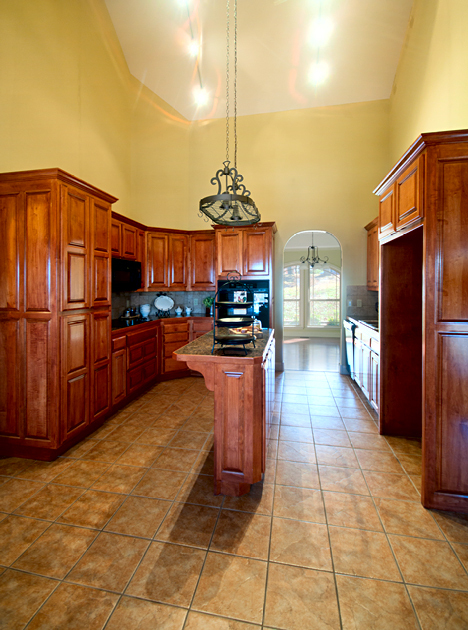 The kitchen has a towering ceiling and is well lit. The dining room is in the background. The back porch, ah-er, deck is a good 20 feet off mother earth and stretches across most of the back of the house. Access to the deck is through the great room and from the master bed room. 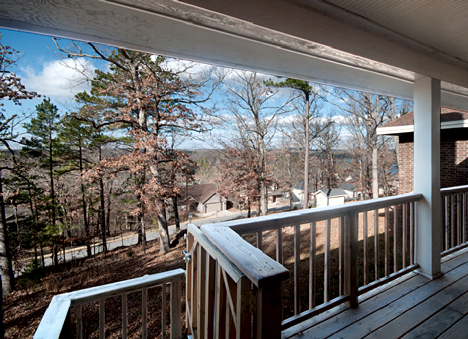 The view from the deck includes Beaver Lake and surrounding residences. The view from the deck is just downright cool. The short winter days make for an abbreviated shooting schedule. So we packed our stuff and headed south, back to LA (lower Arkansas). For our parting shot, we offer the image below, from LA. This lone tree in a ready-to-harvest soybean field near Cornerstone, Arkansas continues to peak my interest. There's got to be a story there. I am still looking fot it. Every week we shoot more keeper pictures than we have room to publish. Our solution is to publish a weekly pictures only gallery with all of the weekly pictures from Corndancer and Weekly Grist . . . and all of the keepers we did not publish. This week, see some more deck and kitchen shots, the master bedroom and a couple of the comfort station. Click here to go there. The pictures are bigger. Inside this old house, other than the large snake in the kitchen, I am the only noticeable occupant and I am temporary. The last residents of this place bailed out years ago. Afternoon sun makes a valiant effort to light the room and gives us a glimpse of what the residents saw outside their home. In this instance, a farm field and a huge pecan tree. We can be sure the mouse hole came after the folks left and before the snake arrived. From a philosophic standpoint, we can readily see that sometimes the wall between good, and not-so-good is very thin. One more thing, anyone remember Tom & Jerry? Mother Nature and her faithful sidekick gravity have ways of dealing with abandoned structures upon which deferred maintenance has been thrust. This old home now under management by the aforementioned pair and following their procedure is self-destructing right on schedule. Remarkably, the floor handled my 230 pounds with aplomb for which I am grateful. Having ones feet on the ground with the floor at knee level is inconvenient at best. Before we venture further, we would be remiss if we did not invite you to see how the story of this old dwelling place started. 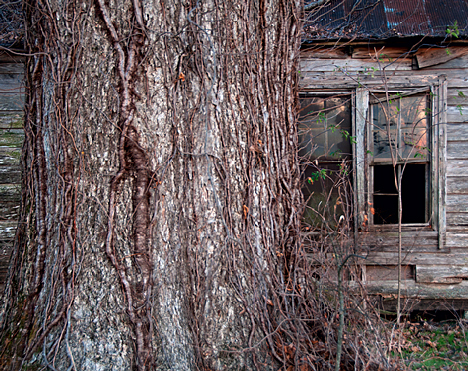 You can do that by clicking here, which will take you to the Photo of the Week page at Corndancer Dot Com where you can find out how the window looks from the outside and see other views of the old house and tree. We’ll patiently wait here while you look. 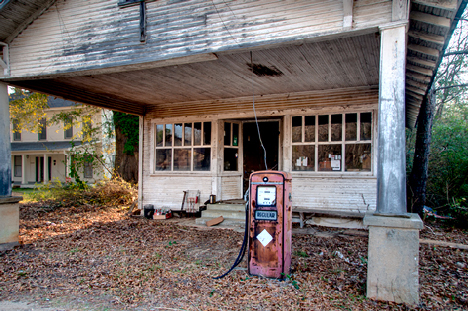 Many, perhaps most older southern rural homes have add-ons. The family got larger, momma or aunt whatsername came to live with her progeny and/or nieces and nephews necessitating more floor space. Most of the time, little attention was paid to aesthetically matching the original construction. This home was true to that form. The original outside planking was vertical, the new, horizontal. Well, they did make the porch overhang vertical. Score one for aesthetics. The add-on, a typical southern configuration accommodates the needs of growing families either by birth or in-migration of relatives. The large front porch appeared to have been screened in. In pleasant months, it could have well been a sleeping porch. The porch is not long for this world. As with most country homes, this one had an out building, the use of which escapes us. I’m betting there was a barn as well, but I see no evidence. Perhaps a fire dispatched it, or heaven forbid, perhaps there wasn’t a barn. 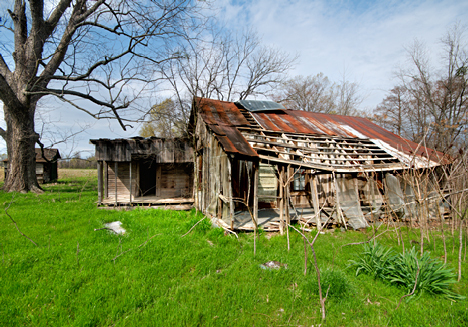 The outbuildings, other than “comfort stations,” were smoke houses, chicken houses, or storage of some sort. See the out building in our Weekly Grist Gallery here. This picture was shot December 5, 2010. The other pictures were shot in March of 2009. There is not much difference. The shrub outside the window is taller and one more pane is missing. Unseen deterioration continues. The pecan tree is huge, as we pointed out in our Corndancer article. 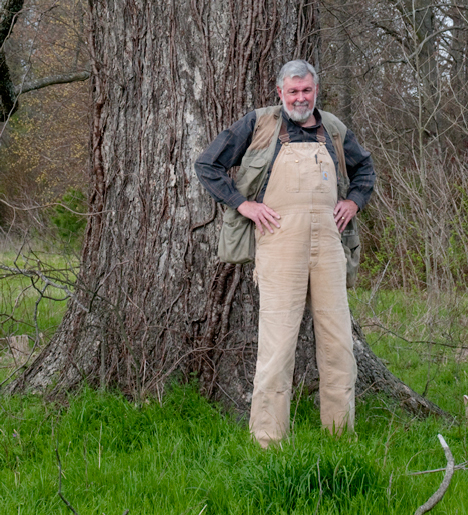 I am generally reluctant to subject you to images of myself, but since I am a known height and width, I serve as a good comparison to establish the size of this immense pecan tree. I am 6′-3″ tall x 46 xl. As you can see, I am dwarfed by the tree. This gives you an idea of the size of the tree. Yours truly is 6'-3." As Mother Nature and her minion gravity stay in business, our glances at these old structures are fleeting opportunities. At a recent visit to this place, a neighbor hinted that this location is scheduled for razing. Better look fast. Every week we shoot more than we have room to show on this page and Corndancer. So we put all of our weekly pictures, including some not seen anywhere else on our Weekly Grist Gallery. The pictures are higher resolution and bigger. This week we have more pictures of the house, the out buildings and tree. Click here to see the pictures. You will like what you see.